Social media has been stormed with a whole lot of unicorns and rainbows lately, but now there's a dessert for those with a soul that veers way closer to the dark and twisty side. Little Damage Ice Cream Shop in Los Angeles, California is not launching some pink and purple swirled rainbow unicorn delight as an answer to the latest annoying food trend, but rather going to the dark side, deliciously, with its Goth-inspired ice cream. 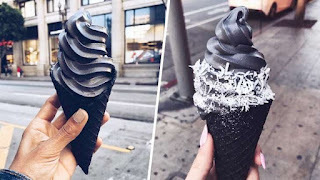 This ice cream creation is just what a dark-lipstick-wearing and depressing-poetry-slinging Goth dreams of, with midnight-black, almond-charcoal flavored soft serve ice cream. It's even served in a black cone! The almond-charcoal flavor actually comes via activated charcoal, which sounds vaguely like a face mask but could also be delicious. We're open. As cool as this almond-charcoal creation is, it's actually not the only way to get ice cream as dark as your heart. New York City's Morgenstern's served up a hard black ice cream called coconut ash, and black sesame ice cream has existed in Japan for years — you can even find squid ink ice cream in some places. However, Little Damage's black ice cream and black cone creation looks really cool on Instagram, and ultimately, isn't that all that really matters?